Image of sun courtesy of NASA. A team of scientists has created an "MRI" of the Sun's interior plasma motions, shedding light on how it transfers heat from its deep interior to its surface. The result, which appears in the journal the Proceedings of the National Academy of Sciences, upends our understanding of how heat is transported outwards by the Sun and challenges existing explanations of the formation of sunspots and magnetic field generation. The work was conducted by researchers from NYU's Courant Institute of Mathematical Sciences and its Department of Physics, Princeton University, the Max Planck Institute, and NASA. 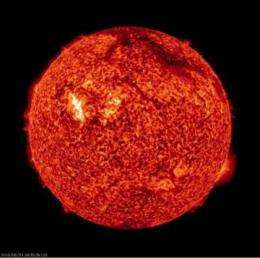 The Sun's heat, generated by nuclear fusion in its core, is transported to the surface by convection in the outer third. However, our understanding of this process is largely theoreticalthe Sun is opaque, so convection cannot be directly observed. As a result, theories largely rest on what we know about fluid flow and then applying them to the Sun, which is primarily composed of hydrogen, helium, and plasma. Developing a more precise grasp of convection is vital to comprehending a range of phenomena, including the formation of sunspots, which have a lower temperature than the rest of the Sun's surface, and the Sun's magnetic field, which is created by its interior plasma motions. In order to develop their "MRI" of the Sun's plasma flows, the researchers examined high-resolution images of the Sun's surface taken by the Helioseismic and Magnetic Imager (HMI) onboard NASA's Solar Dynamics Observatory. Using a 16-million pixel camera, HMI measures motions on the Sun's surface caused by convection. Once the scientists captured the precise movement waves on the Sun's surface, they were able to calculate its unseen plasma motions. This procedure is not unlike measuring the strength and direction of an ocean's current by monitoring the time it takes a swimmer to move across the watercurrents moving against the swimmer will result in slower times while those going in the same direction will produce faster times, with stronger and weaker currents enhancing or diminishing the impact on the swimmer. What they found significantly departed from existing theory--specifically, the speed of the Sun's plasma motions were approximately 100 times slower than scientists had previously projected. "Our current theoretical understanding of magnetic field generation in the Sun relies on these motions being of a certain magnitude," explained Shravan Hanasoge, an associate research scholar in geosciences at Princeton University and a visiting scholar at NYU's Courant Institute of Mathematical Sciences. "These convective motions are currently believed to prop up large-scale circulations in the outer third of the Sun that generate magnetic fields." "However, our results suggest that convective motions in the Sun are nearly 100 times smaller than these current theoretical expectations," continued Hanasoge, also a postdoctoral fellow at the Max Plank Institute in Katlenburg-Lindau, Germany. "If these motions are indeed that slow in the Sun, then the most widely accepted theory concerning the generation of solar magnetic field is broken, leaving us with no compelling theory to explain its generation of magnetic fields and the need to overhaul our understanding of the physics of the Sun's interior." How else should we crack the secret of safe Fusion Reactors, save to see, understand, and comprehend Plasma Fusion naturally occurring, as it were? Notice that the article titles are being adjusted to reduce the appearance of uncertainty. This is a press release which should invite us to question the conventional solar models, but the editors are tinkering with the titles. The titling of articles has a truly *massive* effect upon the number of people who read them. Slashdot is running an article at this very moment on this subject, demonstrating why the Huffington Post does so much better than other news sites. What physorg readers need to realize is that you are a consumer, and that if they fail to play along with the narrative which you prefer, you will simply stop visiting their site. But, this consumer-focused approach to the dissemination of science news is absolutely antithetical to critical thinking. Physorg should be permitted to try attract readers, but the readers need to be on guard that physorg -- and other news aggregators -- are actively altering the titles in order to service your preferences and prejudices. Until people put some effort into differentiating critical thinking from crackpottery, this practice will continue. The consumers have to first *want* to think critically about science, and they must then demonstrate their preference for critical thinking by visiting those news aggregator sites which focus upon the critical dialogue of scientific controversy. But, as things stand, laypeople are trying to take shortcuts to critical thinking by taking polls of scientists, even though history of science is absolutely clear that science oftentimes makes BIG mistakes. If people continue to act like information consumers who exhibit preferences and prejudices for the information they are receiving, then this practice will intensify. The way out of this feedback loop is to embrace controversy in science within the speculative sciences -- such as solar physics. Questioning assumptions in science is not an indication of a crackpot. People need to show physorg that they understand that. "'MRI' of the Sun's Interior Motions Challenges Existing Explanations for Sunspots"
Now, multiply this by every article you read on every science news aggregator site, all of whom are vying for your attention by appealing to your preferences and prejudices, and you have a recipe for undermining the free-flow of information which might cast doubt upon conventional theory. The very fact that people *want* conventional theory to be right -- based upon the fact that they've not put much investment into learning any other framework -- is sufficient, by itself, to induce a preference for that idea. See "Current decisions shape your future preferences"
To be clear, Drudgereport does the exact same thing, knowing that their readers oftentimes don't click on the articles. This finding may possibly be explained by the electric universe theory, and I'll be interested to hear that take on it. Re: "But your approach of you are being held back by some hidden conspiracy does not play well. It makes the EU side look bad and the EU side spends a lot of time talking about the "conspiracy" side of things." The word "conspiracy" is inappropriate here. The proper term is "authoritarian". When people in power use that power for the purpose of undermining legitimate skepticism, it's called authoritarianism. And it happens all of the time. Just open your eyes, and look around you. It's precisely what we would expect if a paradigm is dying: People will defend that failing paradigm long after it is appropriate to do so. Re: "Then when you present your explanations of how this EU model works you get so many things wrong it makes those who believe in plasmas in space look bad." This is so vague as to be useless. You're not engaging the details of the arguments. Re: "Until you actually can prove your theories you need to back off a bit." Re: "The biggest hole in the theory is the idea that fusion is not the power source of stars, but instead it is the electrical currents flowing through space." And yet, we see FAR more movement within the low-energy nuclear reaction community of researchers than we do in the hot fusion group. Furthermore, there's by now more than one researcher who is claiming that radioactive decay rates are in fact affected by a sidereal component of some sort. Furthermore, I'm additionally seeing reports from yet others that decay rates have been modified within the laboratory since the mid-60's. I'd be willing to bet that you've not even read these sources. It is commonly believed that there is an electromagnetic dynamo inside the Sun. That dynamo has long been thought to be powered by two forces: the stretching and winding of magnetic fields due to the Suns differential rotation, or change in rotation rate, caused by differences in latitude, and the twisting of those fields because of rotational effects on structures rising up from deep in the Suns interior. The former is called the omega effect and the latter is called the alpha effect. Until recently, those two forces were thought to be what powers the Suns magnetic field. Those movements through the Suns substance, as well as thermal convection due to the hypothetical radiation generated at the core, are required to be above a certain power threshold or the theory cannot be sustained. Has anyone heard of the Fusor? It uses electricity to produce fusion on a tabletop. Look it up on the internet if you have your doubts. This could well be the mode of operation for the sun and stars. I don't think anyone, including electric universe proponents deny fusion is taking place. It is the location of these reactions that differ from one theory to the other.